HANNAH WINTHROP continued her letter to MERCY OTIS WARREN in May of 1775 describing the flight from Concord to a place of safety. She is saddened by the closure of Harvard and the disruption of education for its students. She fears for the library and worries that her husband will not be able to continue his work in astronomy. Thus with precipitancy were we driven to the town of Andover, following some of our acquaintance, five of us to be conveyd with one poor tired horse & Chaise. Thus we began our [pilgrimage] alternately walking & riding, the roads filld with frighted women & children Some in carts with their tallest furniture, others on foot fleeing into the woods but what added greatly to the horror of the Scene was our passing thro the Bloody field at Menotomy which was strewd with the mangled Bodies, we met one Affectionate Father with a Cart looking for his murderd Son & picking up his Neighbours who had fallen in Battle, in order for their Burial. under the shade of two venerable Elms on a gently rising, one flight of steps with a View of a spacious meadow befour it, a Small Rivulet meandering thro it, the grassy Carpet interspersd with a Variety of flowery shrubs, several little mounts rising in the Conic form intersected with fertile spots of waving grain. The Horizon bounded with a thick wood as if nature intended a Barricade against the Canonade of some formidable despot. But here all is perfect Silence, nothing is heard but the melody of the groves & the unintelligible Language of the Animal Creation. From the profound stillness & serenity of this Woody region I can almost persuade myself we are the only human inhabitants of Creation, & instead of Losing my fondness for Society I shall have a higher relish for the pleasures of friendly Converse & Social endearments, tho the Family we live with are very obliging. But alas the gloomy appearance of mortal things sets the Vanity of the Clearest demonstration before me, nor can I forbear to drop a tear over that Seminary which has been the glory of this Land, and Lamenting those walls early dedicated to the Study of Science & Calm Philosophy Instead of the delightful harmony of nature nothing but the din of arms & the Clarion of War. the Youth dispersd, the hands of their preceptors sealed up, those fountains of knowledge the Library & Apparatus entirely useless & perhaps may fall into those hands whose highest joy would be to plunge us into darkness & Ignorance that we might become fitter Subjects for Slavery & Despotic rule, my partner wishes some attention might be paid to these important Treasures. Oh shall we ever be restord to that peacefull abode, that happy roof where retird from all the glitter & noise of the gay & busy world my Consort would joy to finish his mortal life in investigating the great Temple of the Skies & adoring the Divine Architect of Heaven & quietly quitting this Lower Creation. When I think of the Sufferings of my Friends in Boston I am ashamed that my inconvenience should have such an undue effect upon me. I blush that I have so little Fortitude to encounter the Struggles we must expect to meet before the unnatural Campaign is over. I must Confess I sometimes Indulge Fears which excite mirth rather than Sympathy in my Philosoper. I have not seen our Son Since his return from Sea. It is a satisfaction that our Sons possess that love of Liberty which will engage them in the Cause of their Bleeding Country. It would give me great pleasure to pay you a Visit in your hospitable abode of peace & Elegance, but the Length of the journey & the uncertainty of the times forbid it. It would add Inexpressible pleasure to us to see you in our Rural retirement, then might I profit by your Example of Equanimity & patience in times of Affliction. We are now cut off from all our Living, but those divine intimations in that Sacred Book which have been the Consolation of Many an Exild one must be our Support. pray Let me hear from you as often as possible. Read the entire letter HERE. 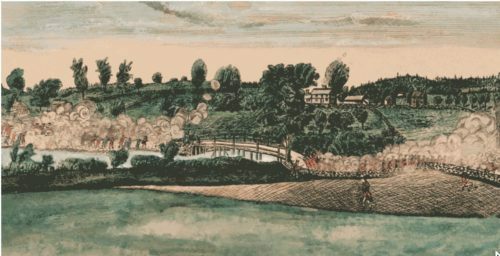 The engraving of Amos Doolittle’s “The engagement at the North Bridge in Concord, 1775” is a focal point of the gallery at the Museum of the American Revolution dedicated to the Battles of Lexington and Concord. HANNAH WINTHROP continued her correspondence with MERCY OTIS WARREN, sharing news of the occupation of Boston by the British: “Loads of english goods…the fortifying of Boston neck, [and] the huge canon now mounted there,” that has led to the move from their house in Cambridge to a “humble habitation at Concord.” In a letter written at some point in May 1775 she describes in considerable detail the battles that occurred in the previous month at Lexington and Concord. . . . . [S]ince we were dispossest of our earthly enjoyments, all nature has seemd to be reversd, & with it the weakned mind of your friend renderd incapable of attending to those pleasures which made life agreable. Nor can she yet forget, nor will old Time ever erase the horrors of that midnight Cry, preceeding the Bloody Massacre at Lexington, when we were rousd from the benign Slumbers of the season, by beat of drum & ringing of Bell, with the dire alarm, That a thousand of the Troops of George the third were gone forth to murder the peacfull inhabitants of the Surrounding Villages. A few hours with the dawning day Convincd us the Bloody purpose was executing. The platoon firing assuring us, the rising Sun must witness the Bloody Carnage. Not knowing what the Event would be at Cambridge at their return of these Bloody ruffians, and seeing another Brigade dispatchd to the Assistance of the former, Looking with the ferocity of Barbarians, It seemd Necessary to retire to some place of Safety till the Calamity was passd. My partner had been a fortnight Confind by illness. After dinner we set out not knowing whither we went, we were directed to a place Calld fresh pond about a mile from the town, but what a distressd house did we find there filld with women whose husbands were gone forth to meet the Assailiants, 70 or 80 of these with numbers of Infant Children, Crying and agonizing for the Fate of their husbands. In adition to this scene of distress we were for Some time in Sight of the Battle, the glistening instruments of death proclaiming by an incessant fire, that much blood must be shed, that many widowd & orphand ones be Left as monuments of that persecuting Barbarity of British Tyranny. Another uncomfortable night we passd, some nodding in their chairs, others resting their weary limbs on the floor. The welcome harbinger of day gave notice of its dawning light but brings us news it is [?] to return to Cambridge as the enemy were advancing up the river & firing on the town, to stay in this place was impracticable, methinks in that hour I felt the force of my Mother Eves Soliloquy on being driven out of Paradise. . . . In the next post, Hannah describes fleeing from the scenes of battle and finding a refuge for herself and her husband. The two letters in this post can be found at the Massachusetts Historical Society HERE and HERE. 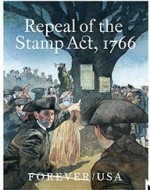 The illustration of Concord is at the Library of Congress. 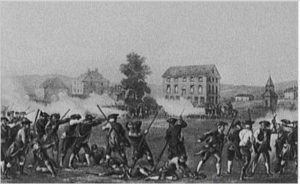 The young Pleasantdale, New Jersey woman JEMIMA CONDICT wrote in her journal that in April 1775 she went with her father to watch the militia drill. Monday Which was Called Training Day I Rode with my Dear father Down to see them train there Being Several companies met together. I thought It Would Be a mournful Sight to see if they had been fighting in earnest & how soon they will Be Calld forth to the field of war we Cannot tell, for by What we Can hear the Quarels are not like to be made up Without bloodshed. I have jest Now heard Say that All hopes of Conciliation Between Briten & her Colonies are at an end for Both the king & his Parliament have announced our Destruction. fleet and armies are Preparing with utmost diligence for that Purpose. as every Day Brings New Troubels So this Day Brings News that yesterday very early in the morning They Began to fight at Boston, the regulers We Hear Shot first there; they killed 30 of our men A hundred & 50 of the Regulors. 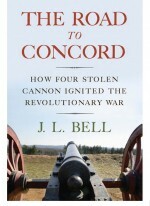 Jemima is likely speaking of Lexington and Concord, a battle that occurred on April 19. There is still controversy over who fired first; the “regulers” are the British. At any rate the news certainly traveled fast. Jemima Condict, Her Book: Being a Transcript of the Diary of an Essex County Maid During the Revolutionary War (Orange N.J.: Jemima Condict Chapter, Daughters of the American Revolution, 1930), 51-52. The original of Jemima Condict’s diary is in the archives of the New Jersey Historical Society. The second excerpt also appears in In the Words of Women: The Revolutionary War and the Birth of the Nation, 1765-1799, by Louise North, Janet Wedge, and Landa Freeman (Lanham, Maryland: Lexington Books, 2011) 29.